Automation of Labeling Machines, Maintenance and Servicing The bottle labeling machine technology has come along way in the process of automation to achieve equipment that has greatly benefited the packaging industry. The various models of the bottle sticker labeling machine have been developed elaborately to meets the exact needs of the bottle labeling process. Important Construction Design The machine frame of construction is made with the stainless steel S304, and high class aluminum alloy with anodizing treatment being incorporated. To enhance performance and durability, parts such as the labeling headsdriven by advanced stepping motors and high quality photo electric eyes for efficient operation.The machines are controlled through programmable logic controls that add onto ease of operation. These processes are also run and coordinated through the PLC system, which uses preprogrammed recipes tailored to the specifications of the different bottles. Special label sensing systems for transparent film labels which have no marks on them. Barcode checking systems for missing or absent barcodes. 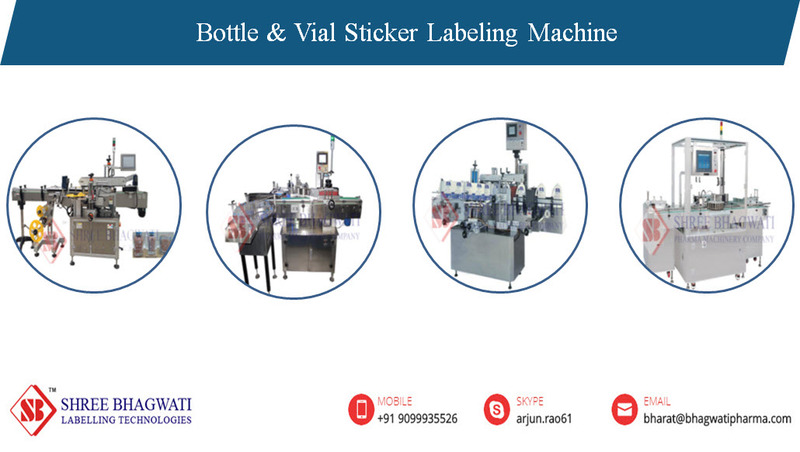 Vial Labeling Machine The vial sticker labeling machine is also an innovation of the bottle labeling machines from Bhagwati Pharma Company. The machine is completely automatic, able to operate at higher speeds than most other bottle labeling machines. The product range for this machine include labeling of round vials ,smaller sized glass bottles, PET bottles, HDPE and PP bottles. This machine has the ability to apply up to 300 bottles per minute based on the sizes of the bottles in the line. The beer bottle labeling machine is also among the automatic bottle labelers manufactured by the company. It is designed to apply pressure sensitive labels around the beer bottles or cans. Similar to other models, the machine is simple to use, calibrate and maintain. Operational instructions are provided manually or inbuilt in the machine for ease of reference. Maintenance The most important of the maintenance practices of the labeling machines is ensuring that the equipment is always clean and free of clogging particles. Manufactures will supply a machine manual that details some of the important maintenance practices that must be keenly followed.